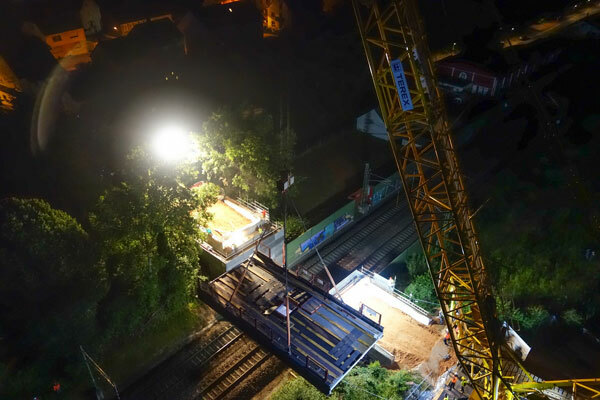 Power and precision – these two characteristics were in high demand on the night of June 19th, 2015 as the new 15-meter-long, 66-tonne Schöneck bridge was installed in the Saarland municipality of Kirkel, in Germany. Trier-based Steil Kranarbeiten used its Terex Superlift 3800 lattice boom crawler crane to complete the project assigned by Illingen-based construction company TKP Krächan. Before the new bridge could be put in place, the old one had to give way. A structure from the ‘60s, the bridge was considered to be at risk of collapse, and had been closed off to vehicles for quite a while. Accordingly, the run-down bridge was removed two months earlier in a night shift that spanned multiple hours and saw the old structure lifted out after being split into eight sections. The Steil team used a different machine to remove the bridge: a Terex AC 350/6 all-terrain crane. The time factor proved to be a challenge throughout: “Since both the old and the new bridges cross over the Paris-Mannheim ICE train route, the overhead lines had to be disconnected from the grid before the lifts were carried out. We were asked to disrupt the Intercity-Express service as little as possible, this meant that we only had a time window of a few hours in both cases,” reports Martin Mittler, who is in charge of resource planning at Steil and was one of the people responsible for the project. The Steil team did not just face a tight schedule, but also challenging conditions. The work site was right in the middle of a residential area, leaving the team with precious little space and making it difficult both to get the Superlift 3800 crane’s components to the site with a total of 19 trucks and to set it up with a Terex AC 350/6 assist crane. “Fortunately, though, the Superlift 3800 crane is really easy to transport, and that made our lives a lot easier. In fact, the modular quick-connect system, which makes it possible to split the crane’s basic structure into two parts, was one of the reasons why the Superlift 3800 was our crane of choice for this project,” Mittler points out. This enabled crane operators Daniel and Mike Schulz to set up the lattice boom crane within the allotted time frame of only two days despite the adverse conditions. The unit was set up with an LH1 configuration with a 42-meter main boom, 205 tonnes of superstructure counterweight, and 50 tonnes of central ballast. However, the working area for the crane had to first be prepared with red ironwood crane mats, as the unstable ground would have otherwise been unable to bear the machine’s weight. Precision work: a lift requiring a deft touch. Once the crane was in place, the crane and the working area were ready for lifting the new bridge. The structure was delivered in two sections and welded on-site, resulting in a total weight of 70 tonnes, including the required slinging gear. After the load was meticulously rigged so that it would be perfectly balanced, the power to the overhead lines was turned off at 11:30 PM and the lift started: Crane operator Daniel Schulz started by lifting the bridge, which was rigged at four attachment points, to a height of 6 meters at a working radius of 26 meters, in order to then swing it over the tracks with a skillful turn. He then increased the working radius to approximately 30 meters by lowering the boom and moved forward with the Superlift 3800 crawler crane by about one meter. That’s where the trickiest part of the lift came in: “We had to set the bridge down on supports with laser-like precision to make sure it was in the perfect position. Thankfully, the Superlift 3800 is the perfect machine for that kind of precision work, as it has extremely sensitive controls that let you apply just the right touch. In the end, that made the challenge easy to handle,” Schulz says while explaining what he considers to be one of the most important advantages of this Terex crane. The tail end of the lift also went smoothly: In just ten hours, the Superlift 3800 crane was disassembled and loaded on trucks in order to start its journey to its next project – which, the Steil team is sure, will once again show just how reliable, powerful, and versatile the crane is.